Founded in 1989 as a designer and manufacturer of network equipment with performance measurement functionality on behalf of many industry leading Telecom companies, Metrodata Ltd has retained these core competencies modernising and adapting them to meet the ever-changing needs of an evolving marketplace. We are a network access company that focuses on making easy to use networking products that meet specific needs across an extensive range of technologies such as Ethernet, Fibre, DWDM, LAN, serial, SDH/PDH and ATM. We believe it is more important to look for long-term value in a partnership with your suppliers, such as Metrodata, than the often knee jerk reaction of just getting the best price. Shaving a few cents off the total cost of a product is no help if the quality is below standard and the equipment does not arrive when you need it. If you can look past the final contract price, here are some areas to research prior to making your final decision and engaging with Metrodata to buy your new products. Metrodata is a manufacturer based in the UK, which is a politically stable environment for trading, so you are unlikely to get sudden fluctuations in labour relations or severe political upheaval that could disrupt your supply of products. The UK also offers a relatively stable weather zone for world trading leaving you free from concerns about your manufacturing or deliveries being disrupted by hurricanes, tornados, severe snow, rain or drought. Having agreed the contract price of your equipment, getting it delivered can on occasion present your next variable. Metrodata has an automated shipping quotation system that scans the quality couriers for the lowest cost route to your location, depending on your requested shipping instructions to us. You also have the choice of instructing your own shipping agent to collect from us if the rates are better. We want you to be confident that you have engaged with us as a quality supplier, so our web site offers easily accessible Product Information data sheets and user manuals together with application specific White Papers that explain how your business will benefit from the use of our technology. There is no mystery to what we are offering but you may wish to chat to us, so you understand how well we meet your needs. Our customers buy from us in quantities from prototyping one’s and two’s up to low thousands in volume. We have the capacity to increase our manufacturing volumes given reasonable notice. The lead time for low volumes of many products is often next day scaling to no more than 12 weeks for much higher volumes. The products are designed for customer installation via simple menu driven commands. Should a Dead-on Arrival product be encountered then we have a fast process to secure you a replacement, see the web site instructions. During the first 30 days we offer a FOC technical support package during normal UK office hours and it is possible to purchase a 24x7x365 4 hour on site response maintenance package for full aftercare. As with most of the industry we offer payment terms of Net 30 days for credit worthy buyers. We are also able to discuss alternative payment terms related to project-based business. On occasion we have been requested for a reference customer and we are always happy to oblige by finding you one as closely linked to your business area as possible. Metrodata is an ISO9001:2015 compliant company using this quality standard to run our business. We produce products for the telecoms market which is fully regulated so each Product Datasheet includes references to the relevant Standards met by that product. While this is not an exhaustive list of the things you may consider, we trust it has covered enough important aspects, that you will now consider giving us a call to talk more on 01784 744700. Metrodata are forward looking, always striving to offer innovative features that benefit our customers. The benefits we can offer you and your customers; products that address your specific needs, are easy to use and reliable, along with customer service second to none. Never standing still, our products are always evolving; with new features added to extend the functionality and offer greater benefits to our customers. Our products provide network scaling; from simple point-to-point service connectivity to complex multi-point networking services. We are always looking to extend our product range and services to provide what our customers and their prospective customers are looking for, so contact us today and let us know what you need? Designing test and monitoring solutions for other manufacturers. First Metrodata labelled product sold for permanent installation. Metrodata launched its first ATM product. Metrodata launched its first multi-service ATM switch. A Metrodata designed a product that was installed and used as part of a D-channel service by BT. Metrodata launched its first products of the Fibre converter family. Designed a product for Intelsat that provided LAN extension over serial satellite modems. Metrodata launched first its LAN extension product family. Metrodata launched our first SDH multiplexers. Metrodata launched the first baseband converter for crypto interfacing. Metrodata launched the FIMO range of serial fibre modems. Metrodata launched the first of our Ethernet Media Converters. Metrodata launched the Emux E1 fibre multiplexer. Metrodata launched the MetroCONNECT family of managed LAN extension devices. Metrodata launched the MetroWAVE WDM fibre multiplexer family. Metrodata launched the MetroCONNECT family of Ethernet Demarcation Devices. Metrodata added Layer-3 capabililty to new MetroCONNECT Ethernet Demarcation Devices. Metrodata launched the NetTESTER Embedded Ethernet Test & Monitoring family. 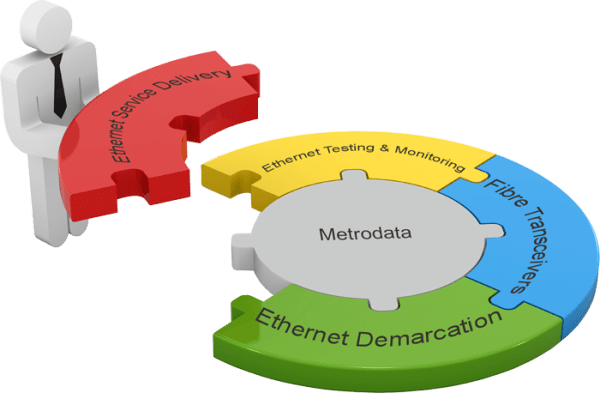 Metrodata launched the 10Gb variant of the MetroCONNECT Ethernet Demarcation Devices and NetTESTER Embedded Ethernet Test & Monitoring families. Metrodata complies with the WEEE Directive 2002/96/CE, for more information click here. Metrodata complies with the RoHS Directive 2020/95/EC, for more information click here. Metrodata is certified to ISO9001:2015.